Within the last year, I sat in a popular Pho joint in Boston and listened to a woman complain to her server that the menu said, “Bun” but that what she got was soup. She was furious. She was expecting a bun, like, a pork bun. Between Bún and Pho, it has pretty much always been the second for me. It came into my life around high school in a little shop at the edge of Boston’s Chinatown that is now a pizza parlor. At that point, I used to throw everything into the soup, Sriracha by the tonne, hoisin, herbs, and all the sprouts. These days I’m more restrained, but my favorite has always been the beef with rare flank, tendon, and tripe. I tend to fall back on this, but thanks to my dining partner Kelly and food expert Suresh Doss, all that may have changed. For those who don’t know, Suresh Doss is a crucial observer of Toronto’s food culture. He writes about food independently, for the CBC, and even leads curated food tours that I hope to partake in some day. He is to Toronto what Jonathan Gold is to L.A., someone who loves the local food community as much as the food. It was my friend Kelly who caught Doss’ article about bún riêu at Bong Lua and suggested that we visit for the soup. It was everything I hoped for and more. From what I understand bún and pho are separated primarily by the shape of the noodle (Bun = round, Pho = flat), and the proteins in the soup stock (pho is pure beef and crystal clear, vs. a cloudy mix with bún). It’s that “seafoam” that makes this dish so unexpectedly appealing, an airy fusion of tomato and crab, it’s a savory souffle that is a part of the broth and also tangles in the noodles. Ms. Pham-Le and Quy Huang Dang’s recipes appear to differ in many ways, but that “seafoam” is there in both. This soup is like Baryshnikov, bold yet delicate. 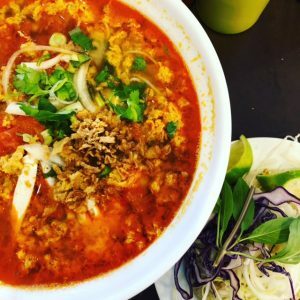 If you think you’ll never visit the threat to American national security that is Canada, and you want to give this fantastic soup a try, please stop by Vicky Pham-Le’s piece of the internet and check out her recipe for bún riêu.